This was (if I remember right) the very first recipe I got off the web to try - from Bawarchi, (a good 8 years ago & the recipe has gone through a lot of changes since then). I first tasted this dish at a Punjabi restaurant and loved it so much - couldn't believe it was eggplant. The recipe I had printed out said that I need to hold the brinjal over a flame until the skin charred... Not having anything to hold the brinjal with, I stuck a knife through it and held it over the flame, with dreams of having tasty bhurtha for dinner... wouldn't my friends be pleased? But within minutes, i noticed that the knife handle had started to melt ! I proceeded to make the curry with whatever roasting the brinjal had undergone in those few minutes and was quite disappointed with the end result (not surprisingly). Years later, I cooked the brinjal in the oven at 450F and that worked well but it would take a good 45 minutes or so to get roasted eggplant... but now I've modified things quite a bit and use the long, purple brinjals instead of the big fat ones since these have lesser seeds and the skins aren't too thick. I also nuke them in the microwave for about 12-15 minutes and don't even bother removing the skin. I like this method the best because it's quick and easy and my husband loves the end product. 1) Wash the eggplants and wipe dry. Cut the calyx off. Make a couple of slightly deep slits on each eggplant (so they don't burst when microwaved). Spray with some cooking oil and rub all over the eggplant. Place these on a microwaveable plate or bowl and cook on high for about 12-15 minutes. Remember to turn them over once in between. They will turn soft, wrinkly and shrink. Let them cool a bit and chop very finely. I do not peel but you could peel them if you wish so. 2) Heat the oil in a pan and toss in the cumin seeds, once they sizzle, add the chopped onions, ginger, garlic and g. chillies. Saute this till the onions start to brown and caramelize. This is important. 3) Now add the chopped tomatoes, half of the chopped coriander leaves and some salt. once the tomatoes soften, add salt, turmeric , chilli powder, coriander powder, cumin and garam masalas. Give all this a quick stir before adding in the chopped, almost mushed up, eggplant. 4) Allow this mixture to roast on a medium flame (stir every minute or so to ensure it doesn't burn) for about 10 - 15 mins. 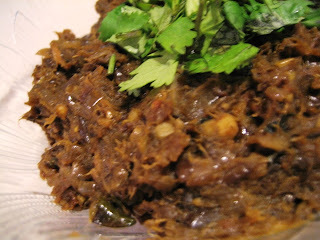 5) Garnish with the remaining coriander leaves and serve with warm rotis. Thats great Laav - MW it! Nice idea. I Buy the big one cut it & pressure cook it & follow pretty much same as your recipe...But still like the flavour from the ones roasted on gas or coal! MW'ing it is a good idea and is such a time-saver. A friend of mine had a really bad experience with this very same veggie in the MW. The whole thing exploded and it took forver to clean up the mess. 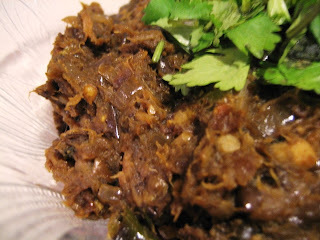 While eggplant is not one of my favourite vegetables, baingan bharta is something we enjoy. But I have temporarily stopped making it as only eggplant with a lot of seeds seem to be available out here! Good idea to cook it in the MW..
Looks delicious Laavanya! I too had a bad experience while making this for the first time. Have u sent Sailu a request to include yours? Thank you Viji and Richa. I guess pressure cooking is a good method too Seema. TBC, oh yeah.. that's why I put the slits in to prevent that. I had trouble with this veggie too but have started liking it nowadays. Raaga, the microwave has worked great for me. Do try. Redchillies, Ha ha.. we were.. Thanks.. do try. Thank you Nammu. Hope you try and like it. Aparna, that can be such a put-off that's why i've switched eggplant variety. Thank you EC & Asha. HappyCook, i don't think you are alone. Oh you did Anu? but now I find this is super easy. Sagari, am glad you like it. Thanks. TBC, yes.. rajitha had mailed me about it just yday too... I did send in my information.. got to check if it was included. Thank you. If you permit me to, you can check out my blog with the bharta version. You just have to keep the big fat eggplant right on top of the stove on full & keep turning it around. In about 5-10 mins (depending on the size of the vegetable) you will have a fully roasted baingan. Try it out, I am sure you will like it. The big fat eggplant does have a different texture altogether.